Tuesday brought only the latest proof that Donald Trump, ever the provocateur and real estate tycoon, hasn’t the public interest at heart nor even the stones to stand by his chicanery. 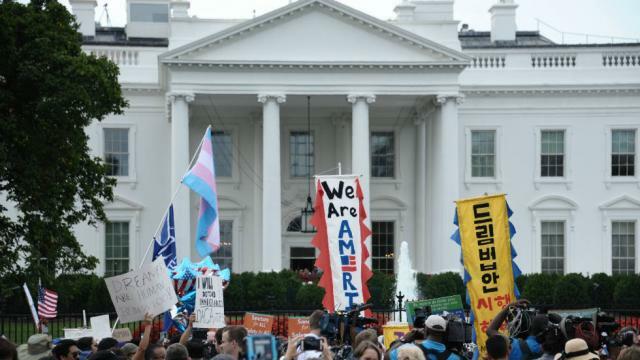 His administration announced it would terminate—maybe, more on that in a moment—the Deferred Action for Childhood Arrivals program (DACA) instituted by former President Barack Obama. DACA granted undocumented immigrants who entered the US as children legal status and work permits. It was founded on sound principles about the executive’s prerogative to prioritize limited resources. It is true this was Obama’s second choice. Congress had repeatedly failed to pass the DREAM Act, which would have had the same material effect. But Trump’s move and the resulting doubt inflicted on DACA enrollees is only the latest cruel and dangerous caprice he has inflicted in his short time in office. Trump’s Attorney General, Jeff Sessions, delivered the news. The administration argues this move will force Congress to act. Even if true, it does not change the fact this decision was primarily predicated on Trump’s whims, not his Justice Department’s threadbare legal reasoning. Trump just gave a masterclass in cowardice²: he cancelled #DACA, and then trotted out Sessions because he was too scared to do it himself. The DREAMers, as some call DACA recipients, number about 800,000 and enjoy wide support. Many Republicans publicly broke with Trump, over his rescission of DACA. Trump expressed some idle interest in a legislative fix after the announcement. Now that the backlash has begun, he opened the door to maintaining the program, undercutting his attorney general again. The true irony would be the coldest, most divisive president in modern history accomplishing what is widely seen as a uniquely American act of compassion: admitting children into the national family after being brought here without their consent. This speaks to the immigrant experience, which is essentially an American experience, Native Americans notwithstanding. It would be an unmitigated good if the DREAM Act became law. Though, invariably our broader immigration problems would remain. (Trump wants his wall, dammit!) But the bill and certainly his possibly transitory interest in sparing the DREAMers will not undo the uncertainty, fear and the darkness Trump has unleashed. This all stems from an original sin of Trump’s while in office. Of all the moral failings or amoral behaviors of Trump, what fundamentally damns his administration—and the nation—is his caprice. It is his caprice undermining our nation’s credibility with our allies, from Great Britain to Germany to Australia to Mexico (are they still allies?) His caprice spills, via tweet, an objectively valuable national security secret—what’s on a president’s mind—out to our foes’ psych profilers. His caprice leads his fellow madmen in the world to take America’s admonitions less seriously. It is his caprice that obsesses about wins and image and Apprentice-style Supreme Court announcements. In the case of DACA or the Muslim Ban, this caprice above all begets cruelty. And all of this is in service to nothing but his narcissism. To serve such a thing is to serve nothing. And for a president, it is to preside over nothing but his fantasyland where all exist to serve him alone. A true perversion of public service. It does appear the typical “tune-in-next-time” air that hung over the days leading up to Tuesday’s DACA announcement masked rare, legitimate debate on the issue. But Trump’s DACA punt to Congress—and his continued “will I or won’t I”—is itself cruel. All this proves Trump still has no convictions, no beliefs, no interests, no concerns. Exception! He cares how it looks (on TV) and how people will like him. Hence his humiliating Sessions hours after he signed DACA’s death warrant. Congress now has 6 months to legalize DACA (something the Obama Administration was unable to do). If they can't, I will revisit this issue! A reprieve would be good, but it won’t change the dangers and moral decay this administration has ushered in. With the flick of a pen, 800,000 lives could be destroyed…or not. With healthcare, millions were in jeopardy because of Paul Ryan’s godless ideology, Mitch McConnell’s cynicism and Trump’s insecurity-driven need to undo Obama’s legacy. Globally, there is pulling out of the Paris accord or the Iran deal merely because Trump wants it so. This is a dictatorship, by other means—almost. Despite the Republican Senate’s near-complete acquiescence to Trump’s appointments, Congress still retains its own prerogative. The legislature’s inertness, even in the face of its majorities’ morally bankrupt leaders, still shows agency. After all, Senator John McCain’s vote against the “skinny repeal” last month sheltered those millions from Trump’s caprice—for now. The courts remain active and robust. Neil Gorsuch may yet prove a bigger nihilist than his late mother—before Scott Pruitt, she was perhaps the EPA’s angel of death—while making Antonin Scalia look like a commie. For now, Anthony Kennedy and even John Roberts will provide a bulwark against the worst, provided Ruth Bader Ginsburg and Stephen Breyer hold out. But this does not undo what we must endure for many more months and years. True, as Democrats proved this week, rolling this man can be liking taking candy from a 71 year-old baby. It is moral to use this fact to prevent greater destruction that might otherwise be a colonic obstruction or bleary-eyed tweet away. For Democrats not to act like this would be a dereliction of duty. NEWS — TRUMP agrees to 3-month debt limit increase in meeting w hill leaders. All GOP leaders were opposed, per multiple sources. In last 48 hours, Trump sided with Schumer and Pelosi on debt ceiling increase and called for Congress to enshrine DACA. So much winning! Yet anything accomplished will be stained by his caprice again and again. This funhouse mirror depiction of a republic remains, not in service to the people but himself or, at best, his narrow base. Meanwhile, the still brimming swamp grows more fetid with each of Trump’s tweeted defecations. Little will change in the short-term. But elected leaders, especially Democrats enjoying a bit of influence for the moment, must be cognizant of the implications. While laws may prohibit it, our system cannot endure this arbitrariness or capriciousness indefinitely. Defeating Trump necessarily comes before reversing the damage he is doing. Yet as it happens, we must be mindful that restoring a rational, reasoned republic will be essential. Only then will plights like those the DREAMers now face become less likely.